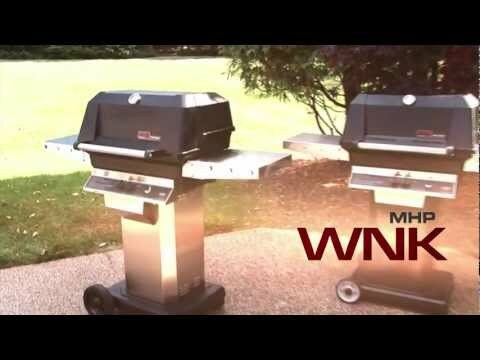 This MHP propane gas grill features a high profile stainless steel lid with solid aluminum end-caps for greater stability and accommodates large cuts of meat and features a Sta-Kool handle which rolls to make opening the hood easy. The two (2) stainless steel cooking grids offer 433 1/2 square inches of cooking area. The 40,000 BTU stainless H-type dual burner has burner ports that are uniform in size and shape with even flames on each port providing superior cooking performance. The FlavorMaster long lasting porcelain briquettes provide constant precisely controlled heat and true barbeque flavor. Includes stainless column and black, cast aluminum patio base, a propane hose and regulator with fuel level gauge, two (2) stainless steel side shelves and stainless grease cup for easy clean-up. Some assembly required for this MHP BBQ Grill. 24 X 15 3/4" 25 1/2 X 17" 25 1/2 X 17" 20 5/8 X 16"